Mickey Mantle baseball cards continue to grow in popularity for card collectors. As a baseball icon of the 1950s, the Mick's baseball cards are in more demand than cards from any other player from the post-war vintage era. Part of the reason was that the New York Yankees were in 14 of the 16 World Series between 1949 and 1964. This dominance will probably never be matched. And much of the reason the Yankees were post-season regulars every year was because of the presence of Mickey Mantle in the lineup. The 1951 Bowman Mickey Mantle baseball card is his official rookie card, but the 1952 Topps Mickey Mantle rookie is the most famous and has a high value even in lower conditions. If you can not afford those, you may want to consider some of his reprint cards. They are very popular with collectors. The 1953 Topps set, which consists of hand-drawn pictures that were made using the real photographs, includes a very popular Mickey Mantle baseball card. While there may be more attractive and more expensive cards out there, the 1953 Topps #82 Mickey Mantle card feels like it is one of the most personal. 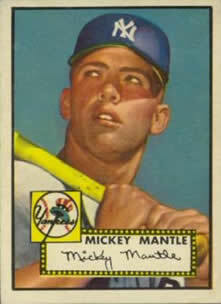 Mantle had an exclusive contract with the Bowman Gum Company in 1954 and 1955, so he has no Topps cards for those years. 1956 and 1957 are some of Mickey Mantle’s best looking Topps baseball cards -- and then for some reason Topps decided to issue a run of Mickey Mantle portrait shots on his baseball cards from 1958 to 1963. Another staff favorite is the 1957 Topps #95 Mickey Mantle baseball card. The 1957 Topps set is the first Topps set to feature photos in a natural background. Although actual photographs were on the 1954 Topps baseball card set, they were on a solid-color background. This set is also the first smaller sized cards issued by Topps. The Dean's Cards inventory of Mickey Mantle baseball cards continues to grow as we aquire new collections. Please check back often to find the Mickey Mantle cards you want. Showing 1 to 100 of 260 products. w/ #65 Mickey Mantle - 1953 World Series Champs! w/o #65 Mickey Mantle - 1953 World Series Champs!